Carnivality: Such A Wonderful Surprise!! 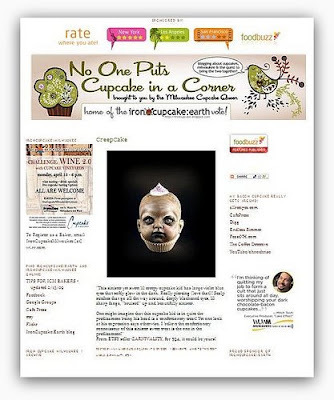 While googling, I accidently found a blog that did a feature on one of my Creepy Cupcake kids! Can you believe it? It is a blog totally dedicated to cupcakes...real ones that is! It seems that the lovely blogger who featured my creepy confectionery is a writer & creator of/for food magazines and has basically dedicated her life in the pursuit of thee best cupcakes! She has a huge following but the best part is the ONE comment that was left about my creepy cupcake kid is PRICELESS and totally made my day! I sold my last Creepy Cupcake Kid today and have plans for more so stay tuned. Can not WAIT to see more. Keep me posted. I also have an affinity for doll heads! LOL.